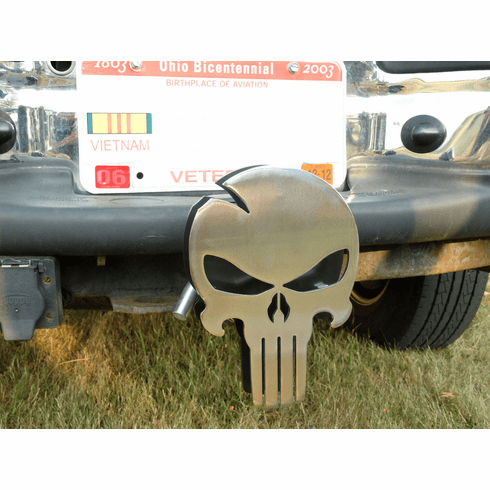 Add one of a kind style with our new Chrome Skull Style Hitch Cover. The new covers are roughly 5.7" x 8" and feature a highly durable and eye catching chrome front plate. The chrome has a grained or brushed finish prior to plating. This adds to the look of the cover while in the sun, but gives it a more satin finish in the shade. The back plate is powder coated black to make the front cover stand out even more. All powder coat is heavy duty automotive grade and should ensure that the hitch cover will last a long time. Note: These are for Class 3 & 4 hitches, ie. 2" receivers. If you select the lighted option it will come with the led's wired and ready to be plugged into your (4) pin trailer wiring. There are (4) bright LEDs that will light up the cover whenever you turn on your lights. All hitch covers are now constant on. When your lights are on, the covers will stay lit up too! Basically all you do is slide it into your hitch, put in your old pin and plug in the lights, done. Product Care: To maintain the hitch cover and prevent corrosion, it is highly recommended that you apply a high quality automotive wax. You should do this upon receipt of the cover and at least once a month after the first application. If you live near the ocean or in places where salt is used on roads throughout the winter you may want to clean and wax the cover a little more often. Care of this product is your responsibility.